INCH 101: Mark Henry's Successful Lift With Inch Dumbbell! This week we start with INCH 101: part 14, because of Mark Henry's successful one hand clean and push press with an Inch replica on June 22, 2002 in New Jersey. Learn more about this amazing feat! This week we start with INCH 101: part 14, because of Mark Henry&apos;s successful one hand clean and push press with an Inch replica on June 22, 2002 in New Jersey. Mark Henry Pressing The Thomas Inch Dumbbell. Inch was born Dec 27, 1881, but if no specific date is offered for an event in his life then his Dec. 27th birth date is ignored and rolled over to Jan. 1. In other words, if something happened to Inch when he was age one, then technically it could be said to have happened in 1882- but only four days of 1882. 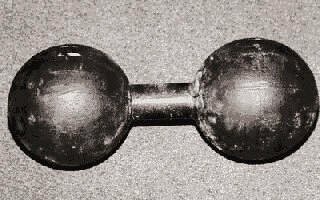 So when Inch says he acquired his first thick handled dumbbell at age 15, that would be 1896, but unless he acquired the bell during the final four days of 1896, it is more communicative to say he acquired it in 1897, or at least during the first 360 plus days of 1897. Of course, if a specific date is offered then it is used in age calculations and references. It was announced at the Old-timers&apos; dinner when Henry made his lift that the 172 had been manufactured in 1898. A careful comparison of the various stories about the 172 reveals that not to be the case. 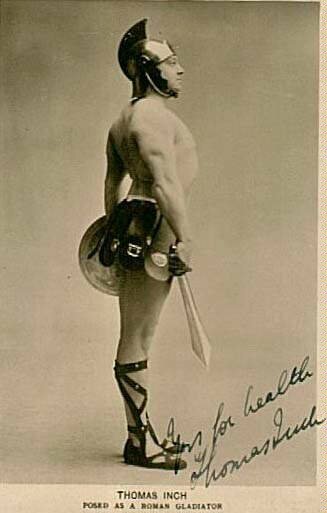 1908 - Apollon & Padoubny wrestle three times at Hengler&apos;s Circus, London; this, I believe, is when Saxon and Inch took the 172 to Hengler&apos;s for Padoubny to try. Apollon, over a disputed decision in wrestling had withdrawn from the tournament for a few days, and it is my belief that Inch used this window of time to avoid Apollon having a try at the 172. Various reports have stated that Inch left the bell for one day or for two weeks. The one day fits history better, because Apollon returned within one week, and had the bell been there he would have played with it. Circa 1929 - Inch began competitions with, not the 172, but the 140 lb bell, which he called his competition bell. Two hands were allowed to the shoulder and then reps in the one hand jerk from the shoulder determined the winners. 1931 - The 172 is retired until World War Two. By a careful study of that list, you can determine that Inch&apos;s claim that Arthur Saxon tried for "15 years" to master the 172 bell, cannot be accurate. If the bell was manufactured in 1906, and if Arthur did not return to England after 1914, then an eight year span is the most exposure that Arthur could have had to the 172- PLUS those eight years were hardly a period of uninterrupted concentrated training on the bell. The Thomas Inch Challenge Dumbbell at 172 pounds and 2.38" diameter handle, or the more recent replicas of the same with 2.47" diameter handle have become a topic of considerable discussion and debate in recent months. Quite frankly, until we began examining the history of what turned out to be four almost identical dumbbells with weights of 75, 140, 153, and 172 pounds, most sources of history claimed there were only three Inch bells. Also, Inch claimed to have lifted the 172 bell overhead literally "hundreds of times" in his lifetime, and at a bodyweight much, much lower than anyone currently seriously thinking of having a chance to clean and push-press the 172. In 1937 Inch made this "hundreds of times" claim even though the bell had been retired for six years at that time, so if he acquired the bell in 1906 which is my opinion based on an incredible amount of study, and if he stopped trying to lift it in 1931, which he acknowledges, then those hundreds of times must have happened in the quarter century from 1906 to 1931. But we know there were periods in that span when he was unable to lift it; this knowledge comes by his own, perhaps inadvertent, admission. So if Inch could one hand clean and jerk the 172 at will using his powers of concentration directed at the specifically involved muscles, and he began doing this nearly one hundred years ago before modern training methods, and enhanced nutrition, and drugs, why is it that we were awaiting SOMEONE of any size, who gained that size by any means, to step forward and not hundreds of times, but simply a single time, grab hold of the 172 and clean it one handed and thrust it overhead? Inch claimed that of all the contemporary strongmen who tried, not a one succeeded. Being careful to await Saxon&apos;s death, Inch then claimed that Arthur himself never mastered the bell even after years of trying, and of having his own replica manufactured, which he did conquer, but somehow the magical mystery tour of Inch&apos;s bell escaped the skilled hand of Saxon. Hogwash. First, of course, Inch never lifted it in this manner hundreds of times, or dozens of times, indeed, he never cleaned and jerked it at all, but would instead substitute one of the lighter bells, according to Edward Aston, who was in Inch&apos;s employ for awhile. Indeed, the very reason that Inch refused to disclose the dimensions of the bell was that if he had so disclosed, then anyone with a scale and a tape measure might catch his slight of hand. He did claim to reveal the actual weight of the bell to Deriaz. Aston, finally tiring of being challenged by Inch to lift the 172, countered and told Inch to lift the bell one handed, put it down one handed, and LEAVE IT sitting on stage so that Aston could immediately try to lift it. Aston, in my opinion had seen Inch numerous times lift one of the lighter, identical bells, then carry it off stage and later that evening return with the 172 to offer his challenge. Aston therefore accepted Inch&apos;s challenge, but to my knowledge Inch never agreed to those terms. Why not? Hundreds of times but he did not want to lift it a single rep for Aston? Inch also claimed a biceps of 19-7/8 at a bodyweight of under 200 pounds. This is remarkable considering that for a period of about five years as a youngster in training he did not increase his bodyweight at all, and claimed to have slender wrists, which to fit the limiting ratio of 3:1 wrist to upper arms could not have taped more than 6.6". But in no photos I have seen of him did his wrists appear so small, nor did his hands appear to David Webster to be unusually small, as Inch liked to assert. He also claimed 15" forearms (measured straight, not goose-necked) and this would have been a ratio of the impossible size of 2.3 to 1 for forearms. So, if you have 7" wrists, to match the ratio that Inch claimed, would require 16.1", and 7.5" wrists need 17.25", measured non-goose-necked. Remember the number of photos taken during those "hundreds of times" that Inch had the 172 overhead, or was in the process of one-hand cleaning it? That number is zero. Of the thousands of audience members who through the years must have witnessed some of these successes, no one has a photo to offer? Not even Inch offered any photos of himself lifting it. There is a photo so described in an old issue of Strength & Health, but that bell is clearly not the Inch 172, but a plate loaded bell. Inch was a masterful businessman who knew how to market himself, so why no photos of the 172 overhead in one of his hands? Hopefully, in the past few installments of Inch 101, we have presented enough evidence to demonstrate that Inch never cleaned and put overhead, with one hand, the 172. Indeed, when a photo explaining his technique to shoulder the bell is offered, he is shown using two hands in a continental, not a clean, with the bell resting on his rearward leaning torso. Indeed when men like Kaz and Phil Pfister need to continental the bell to the shoulder instead on cleaning it, one suspects that Inch may not have quite had the cleaning power of these two mastiffs. Phil indicated this week that he cannot yet one hand clean his replica, but he plans some surprises at the next Arnold Classic in Columbus, Ohio, next year. So, this year on June 22, Mark Henry was planning to try to clean and push-press, or clean and jerk, with one hand in either case, the 172, if his injured triceps would permit. I now present an email from Terry Todd of the U of Texas. I have added dates with brackets for clarity. "Joe, Just a note to let you know-because I think your work has earned you the right to be the first to know the complete details- that three weeks ago, [May 30] on Thursday at 4:50 PM, in the Varsity Weight Room at UT [University of Texas in Austin], Mark Henry cleaned a replica of the Inch Dumbbell with one hand. He didn&apos;t touch it with the other hand at any time during the lift and it was caught high on the shoulder. He had first tried to lift the Bell three weeks before [circa May 9? ], after first cleaning a smaller bell I&apos;d had made for him (made from two 8" long pieces of 6" bar stock joined by a 6" handle made from a piece of 2.5" bar stock) weighing 154 pounds. This was his first chance to lift the smaller bell, and it was still hot from having just been made at the machine shop. I didn&apos;t think he&apos;d try the Inch that first day, but as he lifted the small one so easily I suggested that he make an attempt. So twice, he pulled it up, turned it over to his shoulder, but caught it so that it drifted away from him laterally. He was away for two weeks, [May 23?] then did the exact same thing again - warm up with regular dbs to 150, then lift the small one, then turn the big one over twice but fail to "fix" it. That day, however, I had Jan take a videotape so he could see what he was doing wrong,, which was to not step slightly forward with his right foot (he cleaned with his right hand) so as to get under the bell and "trap" it. When he saw the tapes I think he quickly understood what to do and a week later, [May 30] after another easy clean with the light bell he stepped forward and made the historic clean. Jan was in a meeting that day and so we have no photos or films, but we had two witnesses besides me. Mark was very happy. "He&apos;d have been practicing much earlier, but about two weeks after the Arnold he partially tore the triceps on his right arm and so has been unable to do any sort of normal press or arm training. In fact, the doctors told him to lay off entirely for six weeks or so from all upper body training. As he began to recover we learned that he could catch a light db in a clean without pain and so I suggested that he make an attempt to play catch-up and try to do what we&apos;d been hoping to do - make an "official" attempt to clean an Inch replica at Vic&apos;s dinner. When Mark first hurt himself I was disappointed - both because he was hurt and because we&apos;d spoken earlier about how he could practice with his Inch replica and maybe learn to clean it in time for Vic&apos;s gathering. Following his first clean, he was back two weeks or a bit less and made another attempt, but this time jammed his thumb with the small bell when it bounced back up and hit him as he dropped it to the platform after the clean. So we decided to get the bleeding stopped and wait for perhaps one more chance before the 22nd [(June)]. That chance came this past Sunday, [June 16] when he made an easier clean with the Inch after his normal warm-up and a clean with the smaller bell. This time about ten people in the gym saw him, including Jan. So we have some confidence that he&apos;ll be able to make the clean in front of all the old heroes at the dinner. He weighed just a pound or two or three under 400 when he made these lifts, and he was 30 when he made the first and 31 when he made the second. So far I&apos;ve kept the attempt more or less a secret, although I&apos;ve had to tell a few people to get clearance to do the thing so it won&apos;t upset the program. So if you would... don&apos;t alert the troops until it happens. I&apos;ll let you know how it goes. We&apos;re doing it this way in part as a way of thanking Vic for all his years of work. I wish Mark could have trained on the push press, but I&apos;ve advised him not to put the bell overhead even if it feels light as it would be a shame and set him back in his training and ringwork if he re-injured the triceps. I told him that anyone who really knew lifting would know that the difficult thing about the Inch was that it would be very, very difficult (thought to be impossible by DPW) [David P. Willoughby] for anyone to clean with one hand but not all that hard to elevate overhead. I told him he&apos;d have plenty of chances to put it up for reps down the line. I have to say it was a fine thing to see him clean it, especially the first time, and I wish you could have seen it, too. I might add that he says he can get a much better grip on the smaller bell because the handle is wide enough to allow him to get the whole hand down on the handle-something he can&apos;t do with the narrower Inch. PS By the way, I really liked the photo you took of Mark lifting the Wheels-the one that ran with David&apos;s article about the Arnold. I&apos;d very much like to have a copy, and I know Mark would, too." Inch weighed 210 circa 1909 when he was about 26 years old. So in Saddle Brook, New Jersey on Saturday night June 23, 2002, with a camera crew from the World Wrestling Entertainment company (formerly WWF) standing by, and with about 250 people watching, Mark Henry came out, and with one hand, power cleaned (dipped very little) the Inch 172 replica and push-pressed it overhead. In my opinion, this is the very first time that an Inch 172 has ever been one handed all the way by anyone. If Mark weighed about 400 pounds, then the bell represented 43% of his bodyweight (for comparison, a 200 pound man would need to succeed with an 86 lb replica, to have proportionate strength). And lest anyone pooh-pooh this comparison, keep in mind that weight classes have been a part of weightlifting for more than a century. Feb 1, 1929 On the very day that Rigoulot was involved in his situation, Henry Lenz was born in San Antonio, Texas. Lenz would later become Mr. Muscle Beach on July 2, 1952. For the record, Mark&apos;s success came at 11:15 pm- thanks to 3Crusher of the grippage.com for the exact time. Nonetheless, honor to Mark Henry for being the first man of any weight to conquer the Inch 172. Who will succeed next? Will a woman ever be able to join this group? Will anyone ever be able to clean and then jerk or push press a replica in each hand at the same time? Or to farmer&apos;s carry an Inch in each hand? John Wood has already grabbed a replica in each hand, off a table, pivoted, walked a few steps and held the bells for a total lapsed time of 45 seconds which his sister snapped some photos (see Iron History Gallery for two of those shots). On The One Arm Lift. In May 1911, Inch&apos;s strength level had descended to a point where he could one hand clean, on a standard 1" bar, only 170 pounds; so logic demands that he could NOT have lifted 172 on a 2.38" bar! So somewhere between when he introduced the 172 in 1907, and four years later, whatever training regimen he was on was slowly zapping his reserve of power. 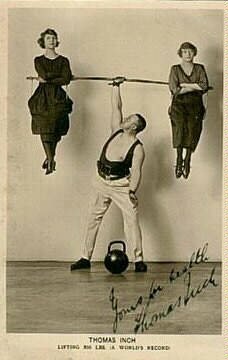 His system was called Miniature Weightlifting. Perhaps going backwards in progress would have been more apt. Of course, Inch was telling people that an 8 pound (yes, eight pound) dumbbell was heavy enough for training. Enclosed please find remittance to enroll my daughter in the Health and Strength League. Would you kindly enroll her from the 6th of July, as this date is her first birthday. I am sending you a photo of her with Mr. Thomas Inch&apos;s middleweight Challenge Dumbbell, of which I am now the owner. Whenever she goes into my room, she always makes straight for the bell, almost making me think she has designs on it. My wife and I are already keen Leagueres." Signed Thomas Fenton, Cathays, Cardiff"
"He [Reg] certainly did not close the Inch grip and in view of the fact that Inch was contesting and record breaking at 68, I am sure you will wish to correct this error in fairness to an old favorite." "There is one statement in Aston&apos;s letter that I take keen exception to. It is the statement that &apos;persistent ill-health prevented me from doing better in the wager&apos;." This is calculated to do me harm in my profession of health specialist, and I wish to point out as strongly as possible that there is nothing whatever in my letter which appeared in your issue of August 23rd to warrant the use of these words. The wager ran twelve months, and in a nutshell, my position was: For the first seven months it was impossible for me to attempt records on account of my injured knee (the result of an accident). In May I smashed my ankle, (another accident) which incapacitated me for a further two months. Just as I completed my training for my important attempts on July 25th I took a very severe chill, which led to pleurodynia, and which made it impossible for me to lift by August 20th. I would like to point out that the trained athlete is, like a racehorse, particularly susceptible to chills. There is nothing in the above to warrant any statement about &apos;persistent ill-health&apos;."